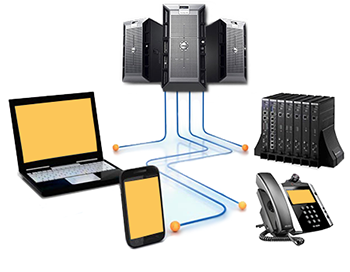 Premise Phone Systems Versus Hosted Systems - Which One Suits Your Needs? We pride ourselves in carrying over 40 years of experience delivering premise PBX systems to companies of all sizes. We’ve implemented thousands of these systems, guaranteeing the right solution for the right infrastructure. All clients and customers have enjoyed unparalleled service and support in addition to a lower TCO. Our implementation processes are guaranteed to reduce your time and effort – we want to make it easy for you to operate. We will always deliver on time, on budget, and according to our clients needs. All hardware and software implemented is accompanied with in-depth trainings and user guides so as to ensure your success with the system. Our award winning VoIP/SIP deployment team strictly adhere to indsutry standards. This means lower operating costs as well as greater flexibility. Similar to our hosted platform, a SIP standard premise PBX platform means complete freedom in terms of your preferred phone hardware; you are at liberty to choose from a wide selection of polycom phones, cisco hardware, SNOM phones, etc. All our solutions – hosted or premise – are standards based in order to leverage available technologies and protect our clients investments. Our roots trace back to 1970 when we created one of the first interconnect businesses in the country at the divestiture of the original bell companies. Over the last 40+ years we have successfully installed thousands of business phone systems across the country and around the world. During this time, we perfected the art of listening to our clients’ needs and then designing innovative solutions to exceed their expectations. Is a Hosted or On-Premise solution the right choice? While other providers only offer a single solution and hope you fit in to their box, YipTel delivers Hosted and On-Premise solutions as each have their own benefits. We will work with you to access your needs and show you multiple solutions in order to help you to choose the right solution. The intuitive, independent MXIE (Media Exchange Interface for End Users) desktop client integrates and manages all of your communications functions. It lets you see the presence status of others in your company. Out-of-the-box, you’ll have functions such as sending emails, controlling all calls via desktop phones or softphones, making high definition video calls, sending and receiving faxes, sending secure instant messages and voice messages, using voicemail, launching a collaborative MXmeeting™ web conference session, and much more – all with a single mouse click. MXIE controls all your calling functions and lets you call and be contacted at any phone you want through the MXconnect™ feature. MXconnect lets you designate any phone as your business phone – a SIP phone, an analog phone, or even a mobile phone or home office phone, and Twinning lets you easily switch between one phone and the other. You can also use MXIE’s internal softphone feature and turn your computer into your phone. Our mobile application brings the power of MXIE Unified Communications to your BlackBerry, Android and iPhone. Our mobile applications extend the award-winning MXIE™ Unified Communications desktop client to the mobile device, and gives employees on the go deep access to their corporate Unified Communication systems to connect them as firmly into their team as if they were in the office rather than at a customer site. The applications seamlessly integrate mobile workers into the corporate Voice and Unified Communications system, providing critical tools such as presence, internal extension dialing and corporate directory access. The Mobile app also provides Least Cost Routing for mobile devices, which can slash cost from a company’s phone bill. MXvideo™ provides integrated point-to-point HD video for award-winning MXIE desktop Unified Communications client. Users may conduct secure, reliable, “face to face” meetings in real-time, regardless of individual location, promoting increased productivity, collaboration and teamwork. This functionality requires no added hardware and is performed with one click. Presence status lets you know if the person you need to reach is available, and even how they may best be reached – no matter where they are located across your company’s system, whether they are right next door or in another city. They can also attach a short note to give additional information, like “Back at 2pm” or “In training all day” to make it easier to know how to contact them. MXIE is fully integrated with MS Outlook, as well as your company directory and MXmeeting web-conferencing. One right-click lets you open an Outlook email window directly from your MXIE corporate directory or Buddy List, and launch fully interactive collabora­tive web sessions. MXIE also lets you launch the built-in audio-conference feature that supports up to 30 users in 10 simultaneous sessions, and use MXconference to convert any call into a conference call on the fly. Instant Messaging (IM) lets you spontaneously collaborate with others whenever you need to through a secure chat window. You can have simultaneous IM sessions open with others in your company, and also send instant messages to multiple people at one time. You can save and archive your IM sessions and can also send mes­sages to people who are off-line, and they will get the message when they log back in. MXIE’s flexible design lets you support full Contact Center functions in addition to your day-to-day call and front office needs. MXIE supports a range of Operator Groups and multiple levels of Agent Roles, and lets you log into mul­tiple roles simultaneously. This increases your ability to multi­task and handle over­flow and priority calls. Eliminate your fax machine and costly fax lines, toner and paper, and use MXIE for all your fax needs. MXIE lets you send, receive, store, and forward your faxes. Sending a fax is done with a simple mouse click that launches a Fax Wizard to let you easily find the document in your system and send it. Our custom VoIP solutions can be Purchased, Leased or Hosted (rented) with the flexibility of being delivered with equipment on premise, in a VMware environment or hosted from the Cloud. While other platforms lock you in to proprietary equipment YipTel adheres to the industry standards (SIP). This provides unparalleled flexibility in devices and long term investment protection. We deliver: Mobile Applications, Multi-Site Connectivity, Call Centers, Conferencing, Advanced Reporting, Disaster Recovery, Call Recording, Desktop Applications, CRM Integrations, Intelligent Routing, Business Intelligence, Fax Server, Softphones, Video Calling, and Easy Administration. Download the YipTel Premise and Managed PBX Datasheet (PDF).